Self-Guided Hut to Hut trekking tour in the High Tatras is a great way, how to explore the Tatra mountains at your own pace. Scroll down for more information and FAQs of the tour. 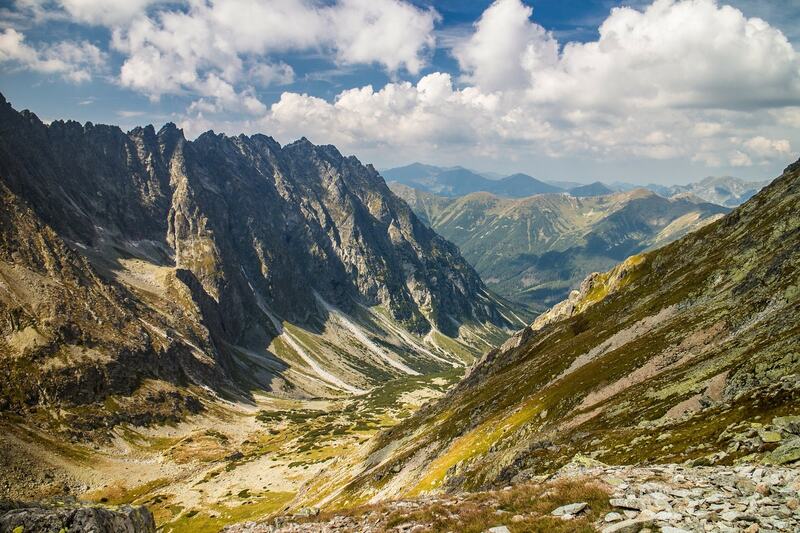 All about the Self-Guided Trekking in the High Tatras. The Hut to Hut Trekking Tour is intended for travellers, who enjoy hiking, being outdoors and want to stay independent during the tour. On the other hand they don´t have enough time to gather all the necessary information about the area, accommodation and hiking. We will arrange the accommodation at the mountain huts, help you with your arrival to the High Tatras and give you the notes to complete the trek. For this tour you need to be reasonably fit, as walking with a heavy backpack requires certain level of physical fitness. Everyday you will walk for approximately 15 km and ascend 800 meters on average. There is at least one short part on this tour, that involves elements of scrambling, so previous experience with scrambling is welcomed. You can learn more information about the tour in itinerary and FAQs (info about weather, food, what you need…) or you can write us an email. This tour is available from 15th June till 31st October, due to the seasonal closure of hiking trails. Tip: Walking with a heavy backpack is much easier with hiking poles, so we recommend you to get a pair. Your trek starts in the village of Tatranska Lomnica. The village is reachable by train or bus from the town of Poprad. We recommend to arrive to Tatranska Lomnica latest at 14:00 in order to have enough time for the first hike. If you need an overnight after your arrival the day before, we recommend to find the accommodation directly in Tatranska Lomnica. Contact us, if you need any help or advice with the booking. From Tatranska Lomnica you will walk to my most favourite place in the High Tatras, where you will spend the night. The place is called the Green Lake and there was built a cozy hut on its shore. The name of the lake was not chosen by any coincidence and you will understand why right after you come there. After leaving the hut in the morning, you will walk on a zig zag path to the top of the peak Velka Svistovka, which is more than 2000 m high. In the surroundings of this peak it´s possible to see the chamoix, so don´t forget to stop every now and then and look around to find them. Today you can leave the heavy backpack in your room, because you will spend there the following night as well. There are more possibilities on this day. I recommend you to walk through the Big Cold Valley, where you can see 26 smaller or bigger lakes. There is no other valley with so many lakes in the Tatras. Do you like walking in a labyrinth? Today you are going to walk through one. Well, it´s not a real labyrinth, but I always feel like in a labyrinth when I walk this path. It´s because of a narrow hiking trail in the dwarf pines. On this day you can rest and have a lunch on the highest situated mountain hotel in the central Europe. In the evening you will come to the Popradske Lake, where you´re going to spend the night in one of the hotels. Today you can choose from two TOPs. The more challenging possibility is a hike to the peak Rysy (2500 m. a.s.l. ), which is the highest peak of Slovak Tatra mountains where you can go without a mountain guide. The less challenging (but still pretty strenous) is a hike to the deepest lake of the Slovak Tatra mountains – the Hincovo lake and from there you can continue to the peak Koprovsky stit. You will spend the night in the same hotel, so you don´t have to carry all your stuff with you during the day. After breakfast you will walk for about 2 hrs to the finnish point of the trek – to the village of Štrbské pleso. Štrbske pleso is probably the most popular place in the High Tatras, because of the lake Štrbské pleso. If you google pictures of the High Tatras, probably a lot of photos were taken right on the shore of this lake. After arrival, you can spend some time at Štrbské pleso or departure from the High Tatras, depending on your plans. This itinerary is not binding. We may change the route, due to lack of free places at one of the huts. But you have to agree with it first. We approach every booking request individually. You will spend the first and the last night in minimum 3* hotel in the town Poprad. During the trekking tour you will spend the nights in the mountain huts. We always try to book the twin room, but it´s not always possible, as the mountain huts have only limited capacity. Some of them don´t even offer twin rooms, but only rooms for 4-8 people. That´s something, you have to expect. When do we receive the detailed documentation?What clothes do we need to wear?Do we need any special gear?Half-Board is included. How about lunches?Do I need a sleeping bag?What is the weather like? When do we receive the detailed documentation? Do we need any special gear? Half-Board is included. How about lunches? You will receive it via e-mail 30 days before the start of the tour. I recommend you to have a good pair of waterproof hiking boots with ankle support. Even if the day is sunny, the weather can change quickly and you can end up walking in rain. Therefore you also need to have a waterproof jacket or a raincoat and some dry spare clothes. Also don´t forget about warm clothes even in summer, because temperature in the mountains is lower. No, you don´t need any special gear, but walking with a heavy backpack is much easier, if you are using walking poles. Every day you will have a chance to eat on other mountains huts, which are on the way. There is only one day, when you can choose a hike without a hut. In this case, you can buy something at the hut where you slept the last night. No, you don´t need a sleeping bag. You will sleep in beds. You can expect the temperature at 1500 m. a.s.l. to be around 20°C, but may be 30°C as well. Usually the weather is pleasant and you can walk in T-shirt and shorts in June, July and August. But, you still need some warm clothes, because the weather may change quickly and the temperature may drop from 25 to 15 within minutes, if it´s going to start to rain for example. Sometimes there are storms in the afternoon or in the evening. In late September and October, the weather is more stable, without so many lightning storms. The temperature is lower. In the mountains, you can expect the temperature to be around 10-15 °C at 1500 m.a.s.l. Walking the High Tatras is a good experience and Slovakation was a great help to us. Martin arranged accommodation, transfers and suggested trails that suited the whole family. Martin planned us a perfect hut to hut trek in the magnificent High Tatras. The difficulty of the hikes varies nicely so the High Tatras is a must for any hiker. Overwhelming sceneries surrounded the cosy huts with very friendly staff. We will certainly return to explore more!